Time off requests are used to indicate when a team member is not able to work. This guide shows how to approve and deny time off requests. Note: This feature may be disabled. To enable time offs go to the Settings => Schedule Settings => Time Offs page. Are you trying to request time off? Read this article. To approve or deny a time off request, click on it and update the Status option. 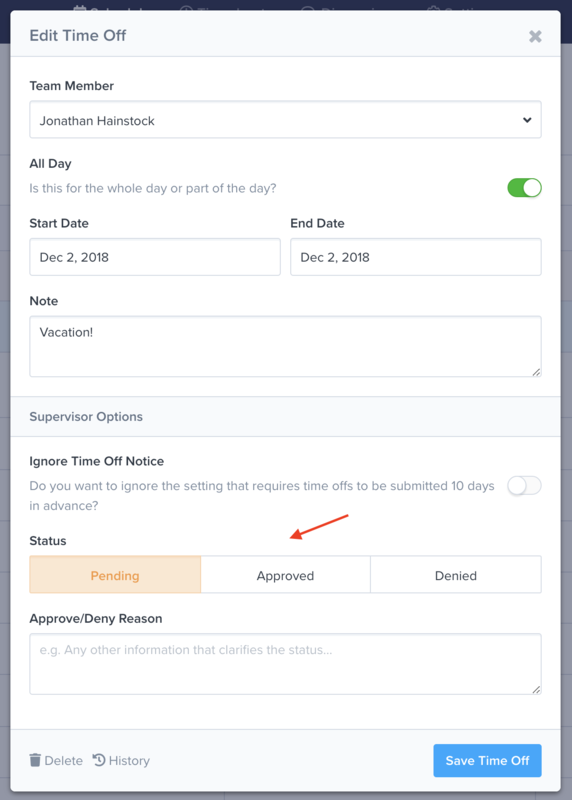 You can add a reason to the Approve/Deny Reason field that will be visible to the team member who is requesting time off. When a time off request is approved or denied, the team member requesting time off is notified. If enabled, all time off features will be accessible within this organization. If disabled, all time off features will be hidden within this organization. Require approval of time offs by a supervisor or manager. If disabled, time offs submitted by team members will automatically be marked as approved. Lock time offs so they can't be updated or deleted by team members once they are approved/denied. This setting makes sense if you want to keep an accurate history of time offs. Managers and supervisors can always update or delete time offs. Only allow managers and supervisors to see all time offs. If enabled, team members can only see their own time offs. Sometimes you may want to prevent team members from requesting off on a day. You can do this by creating a time off blocker. Learn more about time off blockers, here.